In the last 31 years, Sandglass Theater has been able to create original ensemble performances, present diverse artists, produce events in our community, and teach the art of puppetry in our community and internationally. With your support we can continue for the next 31 years. Your contribution is vital to Sandglass Theater and all that we do so please consider making a tax deductible donation towards our $20,000 goal this year. Join the German hand puppet hero Kasper on two imaginative adventure stories that come to life on a whimsical puppet stage made out of a giant umbrella! When Kasper’s best friend, the endearing giant Augustine, wins an airplane in a sweepstakes, Kasper accidentally flies off! Luckily, Grandma and her clothesline come to the rescue. In the second story, Kasper’s efforts to go on a journey are flustered by a comical cow who steals his suitcase and sends Kasper and his friends on a rollicking chase. Audiences of all ages will delight in this interactive call-and-response show complete with musical interludes, comical banter in English and German, and appearances by the feisty clown named Tschokolino. Originally created by German-born puppeteer Ines Zeller Bass, Punschi is now proudly presented by Ines’ daughter Jana. HOW DO WE GIVE VOICE TO A STORY OF PERSONAL INJUSTICE ? Sandglass Theater is known internationally for their extraordinary ability to give voice to human stories through the medium of puppet theater. 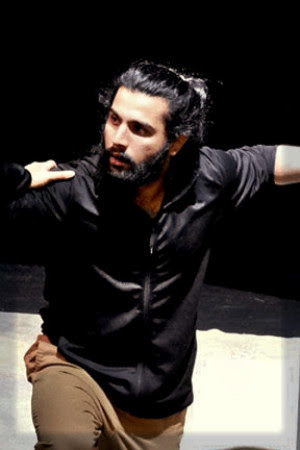 This intensive workshop invites participants into this process, giving practitioners access to essential research, rehearsal, and performance techniques, while teaching the utmost respect for the communities whose stories are represented and the audiences being served. Class members will share stories through through a story circle exercise, developed by John O’Neal in the Free Southern Theater during the civil rights movement. The stories we tell will become the material for exploring both the potential of puppets to embody these stories and for examining the artistic choices we have to make to give the stories voice. The focus of the workshop addresses how we can tell the story of someone else without “playing” that role, and without appropriating another’s culture. 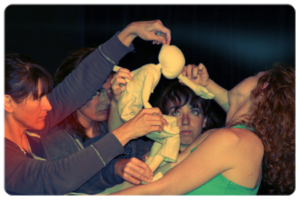 The process looks at song, at the actor/puppet relationship, and at simultaneous scenes, among other techniques, to explore what makes the puppet a special medium for evoking and transmitting social testimony. Participants will work with Sandglass’ exercise puppets from day one, and with any objects or raw materials that seem appropriate for scene creation on day two.